Tampa Bay Industrial Advisors would like to recognize Sara S. Patterson for her blog The Wild, Wild West recently published on CCIM.com detailing how the legalization of marijuana will continue to affect the commercial real estate industry. Like The Wild, Wild West TV show in the 1960s, the legalization of marijuana appears slightly surreal. Its momentum and increasing public acceptance in the U.S. is loaded with contradictions from one state to the next and from one municipality to another. 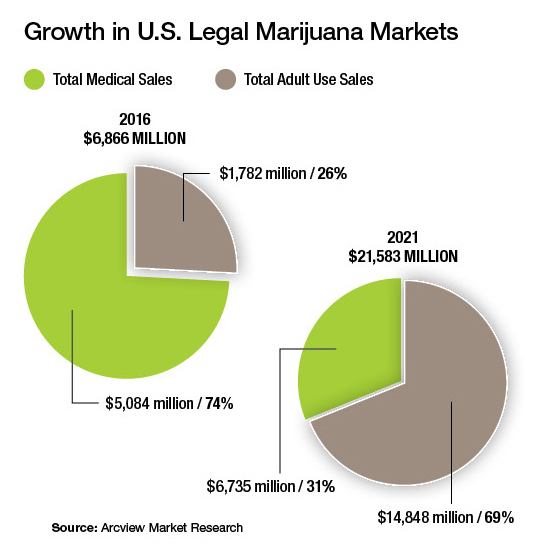 Its legalization directly affects the commercial real estate industry, particularly through the rapid price escalation per square foot in the industrial and retail sectors. For example, several warehouses in the cultivation zone of California that would have sold in the range of $30 to $40 psf have jumped as high as $142 psf following the green light from voters in November 2016, according to Joseph W. Brady, CCIM, SIOR, president of the Bradco Companies in Victorville, Calif. The momentum to legalize cannabis is marching across the nation with heaviest geographic concentration in western states. So far, 28 states and the District of Columbia permit use of medical cannabis, while voters in seven states and the District of Columbia have approved the recreational use of pot. Still the uncertainty about whether the federal government will follow the states’ lead lends risk to commercial real estate ventures involving medicinal and recreational marijuana businesses. Colorado is the test pilot for how medicinal and recreational use of cannabis affects commercial real estate, with Denver serving as the hub. Voters approved the use of medical marijuana in November 2000 and recreational pot in November 2012, with limitations and regulations that often vary from one city to the next. Some cities like Denver embraced the new law, while other cities such as Aurora, Colo., have banned marijuana dispensaries and crop cultivation. “The medicinal side of marijuana set the stage for the recreational side,” says Doug Jennings, CCIM, RE/MAX Alliance-Commercial in Golden, Colo. Currently, his seven cannabis business clients involved in industrial space have generated $9 million in transactions. However, Jennings reports that since traditional lenders are barred by federal law, the all-cash deals turn these transactions into a shadow market, posing more risks for investors and brokers. On the upside, however, deals close faster with cash. “Overall, the Colorado commercial real estate industry has benefited in terms of volume,” Jennings says. Colorado schools are major beneficiaries, reaping the 25 percent of the taxes collected on marijuana sales. With many states struggling with enough cash to fund pensions and schools, the extra tax revenue operates as a strong incentive. Many pundits see Californians’ embrace first of medicinal marijuana and now of recreational pot as pivotal for its eventual federal approval. Although the new law doesn’t go into effect until January 2018, the cost of commercial real estate properties is spiking already. Baddour thinks the many changes in local and state laws could affect profitability. For those willing to take risks, she sees tremendous profit margins at this phase for those commercial real estate professionals who are jumping in. About 90 miles northeast of Los Angeles, the city of Adelanto, Calif., has several industrial parks designated as cultivation zones for marijuana, creating an artificial market bubble for industrial properties. As of December 2016, the highest price paid in Adelanto was $474.03 psf for a 3,850-sf metal warehouse on 2.42 acres, according to Brady. In northern California, for example, two cities are adopting different approaches. Richmond, Calif., has enacted proactive local ordinances that give clear direction to the various market segments of this growing industry, according to Eric Rehn, CCIM. The city’s proactive approach is to help build its industry in what has been one of the poorest cities in the Bay area. In contrast, Pittsburg, Calif., has enacted taxation regulations as its overall guideline, while ignoring the zoning issue. Its existing ordinances ban all cannabis-related businesses within city limits. “Richmond has turned itself around from the worst to the best industrial market with help from a new ordinance for indoor growing operations,” says Rehn, vice president at Kennedy Wilson Brokerage Group in Concord, Calif. “Very quickly, we started seeing RFPs for warehouse space ranging from 5,000 to 200,000 square feet in the proper zoning that offered to pay 125 percent of the current asking rents, as well as picking up all expenses. Like California, voters in Maine approved recreational use of marijuana in November 2016 after a successful transition with medicinal cannabis. Industrial properties are in high demand, with the vacancy rate dropping from 9 percent to 3 percent. While prospective tenants are plentiful, the rising costs are making it tough for traditional businesses to expand in the ever-tightening market. Time will tell if prices in industrial and retail will begin to stabilize in the various cities and states, which have legalized marijuana. No one knows when it will occur and who will win, but the big legal showdown will pit the states against the federal government. In the meantime, cannabis businesses will rise and fall. “Some of my cannabis clients know the business but have never built a building,” Baddour says. “Some clients are real estate investors who need to partner with someone to get the knowledge to grow the marijuana crops. I’ve seen partnerships forming and later falling apart. Several projects are stymied because of lack of funds. In the meantime, consider jumping into the Wild, Wild West of this journey, but be sure to hold on tight and enjoy the ride.